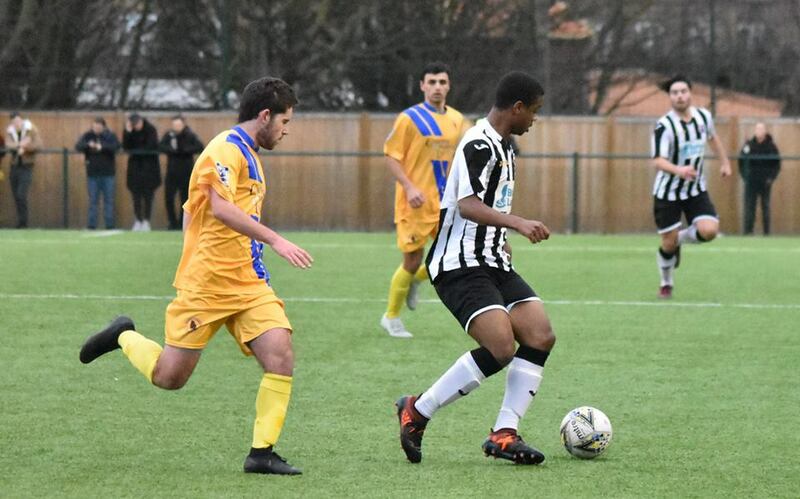 Dean Harrison was able to welcome back Harvey Brinkley and Tunde Aderonmu to his starting XI for the visit of Bearsted as the Fish returned to league action following Tuesday’s battling win against Snodland in the SCEFL Challenge Cup. Sadly, Tuesday’s victory came at a price as it was confirmed that Luke Haidarovic, who had to limp off, has in fact broken his ankle and will be out for a period of weeks. We wish him all the very best with his recovery! The game began evenly, with both sides probing but failing to threaten the opposition goals. The first real chance came on 7 minutes, Rob Brown slipping Tunde Aderonmu through on goal. The striker rounded the keeper but was forced wide and from an acute angle he hit the post. The goal was perhaps the wake-up call Fisher needed, and the remainder of the half was spent largely inside Bearsted’s half as Fisher pressed relentlessly for the equaliser. The home side hit the woodwork for a second time on 27 minutes, when Geddis’ looping header from a Hamill free kick landed on top of the bar. Five minutes later, a brilliant passing move was started with some lovely play by Mott, who worked it to Rob Brown. Brown’s first time ball to the left wing was gathered by Small, who returned the pass to Brown. The free scoring midfielder show low and hard from 20 yards but the Bearsted keeper got down to tip it round the post. Three corners in succession saw chances passed up by Geddis and Mott to force home a ball which flashed across the face of goal. Trey Small then hit the byline and a Bearsted defender dived full length to head behind a cross which was less than a metre off the ground! Another three corners came and went for Fisher without any clear sight of goal. With a couple of minutes remaining before the break, a lovely chip over the Bearsted backline found Aderonmu in space. He ran on to the bouncing ball and tried to lob the keeper but hit it well over. Just a minute later, he had a chance to atone for his mistake. In a carbon copy of the first chance, Mott lifted the ball over the centre backs and Aderonmu ran on to the pass. This time, he was put under pressure by the last man, and held the ball up with his back to goal inside the box. Aderonmu then turned his man and was tripped. The ref had no hesitation in pointing to the spot – penalty to Fisher! Half-time: Fisher FC 1-1 Bearsted FC. The sides went in level at the break, and really it was the very least Fisher deserved. The home side had been well on top since Bearsted’s opener, and would be looking to capitalise on that pressure in the second 45. Dean Harrison made one change at the break, bringing Jamie Brown on in place of Harvey Brinkley at right back. Bearsted enjoyed some early pressure, Hamill having to be alert to clear a low cross at the far post, and the defence combining well to block the follow-up shot. Bearsted then forced a corner down their left, but Wheeler plucked it out of the sky with ease. As in the first half, Fisher were uncharacteristically slow to get going, and Wheeler was again called into action on 58 minutes, gathering a low shot from the edge of the box. Harrison made his second change on 61 minutes, bringing Mathieu Ramsamy on for Chandler Kasai on the right wing, and from then on Fisher really stepped up a gear. On 63 minutes, Aderonmu played a one two with Rob Brown, showing some great close control, then curled a shot just past the right hand post from the edge of the box. From then on, there was only one winner. Aderonmu had a fierce shot tipped round the post for a corner on 68 minutes, then two minutes later he shot over after a lightning break saw Fisher with a 3 on 2 situation and Small in space screaming for the pass. The linesman’s flag denied further chances for Small and then for Mott after great interplay between Aderonmu and Ramsamy. With ten minutes remaining, Aderonmu went off after a good shift, and Kush Campbell-Palmer came on to replace him. Bearsted had a couple of counter-attacking moves up the pitch, but couldn’t get a shot off either time as the home defence held firm. Right on 90 minutes, Campbell-Palmer could have had a fourth for Fisher, but the keeper charged out of his goal to take the ball off his toe. The board went up to show 5 minutes of added time, but Fisher showed no signs of letting up. Jamie Brown hit the byline and cut back towards Campbell-Palmer. A Bearsted defender nicked it away from the striker’s feet, but only as far as Hamill who teed up Trey Small. This time, the Bearsted keeper was equal to his finish. Campbell-Palmer seemed determined to get on the scoresheet, and dribbled round the last man on 94 minutes before being denied once more by the Bearsted keeper diving bravely at his feet to gather. Full-time: Fisher FC 3-2 Bearsted FC. A well-deserved victory for the Fish, which should have been by a larger margin than the scoreline suggests. With the top six all winning, it’s as you were at the top of the SCEFL Premier Division, with Fisher hanging on to top spot on goal difference! Man of the match: this week’s award goes to Trey Small: threatening throughout the game, it was his piece of skill and exquisite finish which allowed the Fish to take the lead. A welcome return for the mercurial winger who has missed the last few games!